This is a wonderful large bucket tote bag with leather hand tooling in a stunning floral design. The bag is crocheted using black worsted weight yarn. 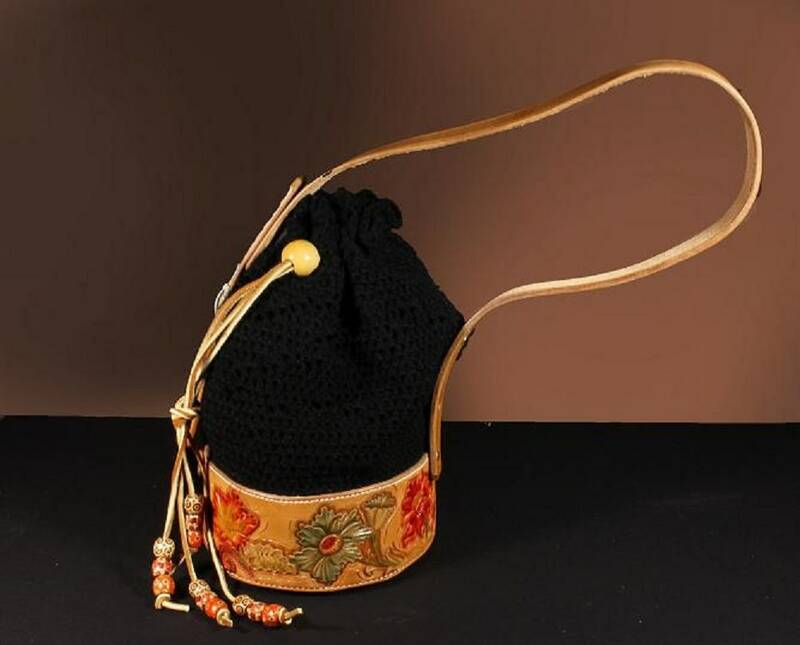 The crocheted bag is securely attached to the leather and the strap is also hand tooled. The bag's drawstring is rawhide with a large wooden bead pull and is trimmed with small colorful wooden beads. This large tote has lots of room for everything you will need to take with you. It will hold all your needs at the football game, a carry-on bag that will hold everything, even a beach or gym bag. For the knitter or crocheter in your life, a fantastic take with you projects bag. This bag can do it all with style and beauty. 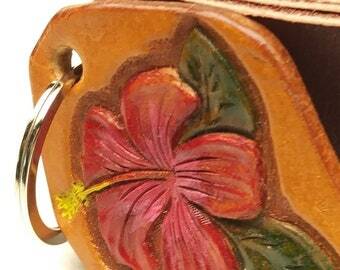 The leather has been expertly hand tooled by Lawrence Carter, Jr. from AcrossLeather here at Etsy. All leather components have been supplied by AcrossLeather. 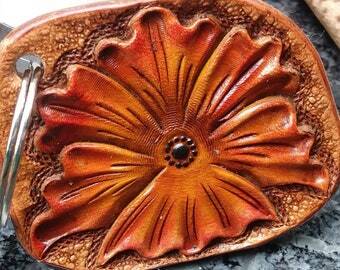 Lawrence is an expert leather artist and I am delighted to work with him. 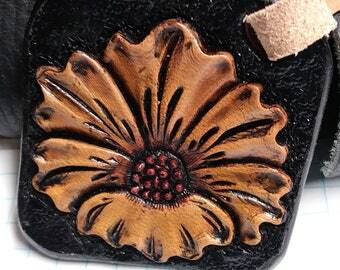 The floral design on this bag is absolutely gorgeous. 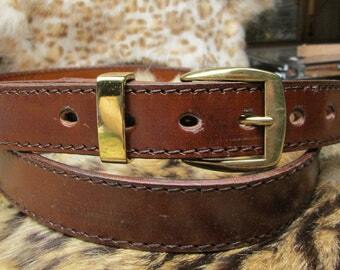 Be sure to also stop by his leather shop for wonderful pet collars, leashes, wallets, and much much more. 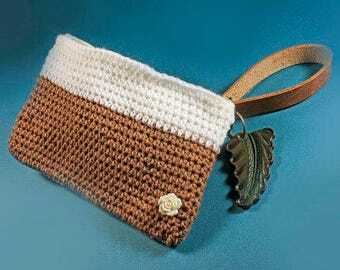 The bag is crocheted and closes using a drawstring made out of rawhide and a large wooden bead. The crocheting is securely attached to the leather. All crocheting is done by me-- Patti Turon here at ADKArtsBoutique. 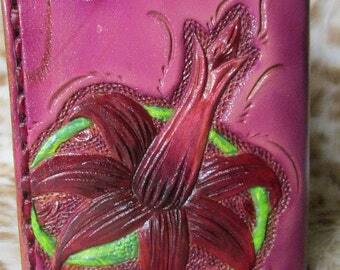 ADKArtsBoutique and Across Leather offer you the best handmade bags, purses, clutches, and totes. Every part of these bags is completely made by hand, by us, with love and attention to detail. 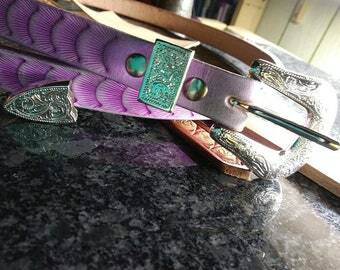 ©Leather Collar, Wallets, Keychains and Beyond.